Struck from the Naval Register 4 February 1919. 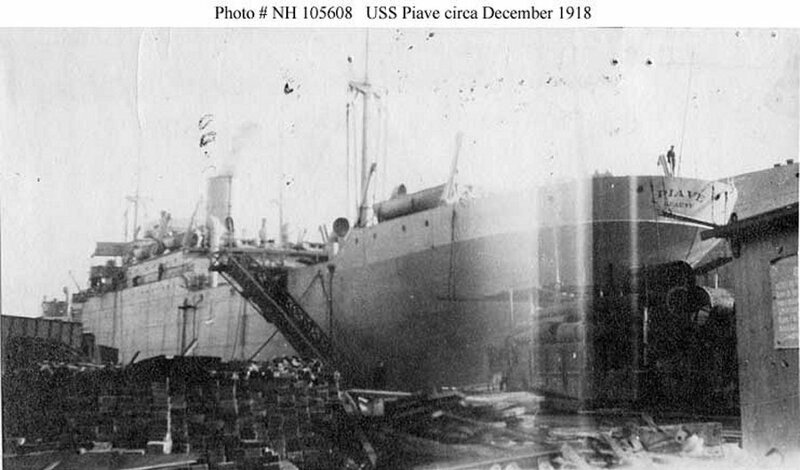 Dictionary of American Naval Fighting Ships History: Piave (No. 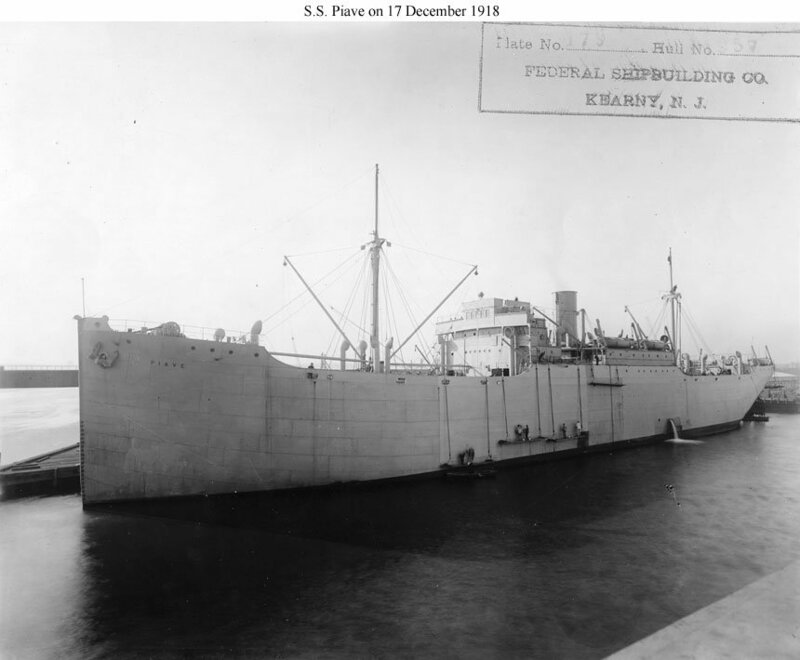 3799), a steam cargo ship was launched for the USSB in 1918 by the Federal Shipbullding Co., Hackensack River, N.J., acquired by the Navy 18 December 1918 for operation as a NOTS vessel on Army account, and commissioned at Brooklyn, N.Y. 18 December 1918, Lt. Comdr. H.L. Mortenson, USNRF, in command. After fitting out and upon successful completion of sea trials, she steamed for Falmouth, England 14 January 1919 with a cargo of flour and pork destined for Ameriean troops overseas. Piave arrived Falmouth 28 January and steamed on for Rotterdam the same day. That night, during a fierce storm accompanied by a blinding snow, she went aground about half a mile east of Gull Lightship in the Straits of Dover. Although she parted amidships and lost her entire cargo, all hands were rescued. 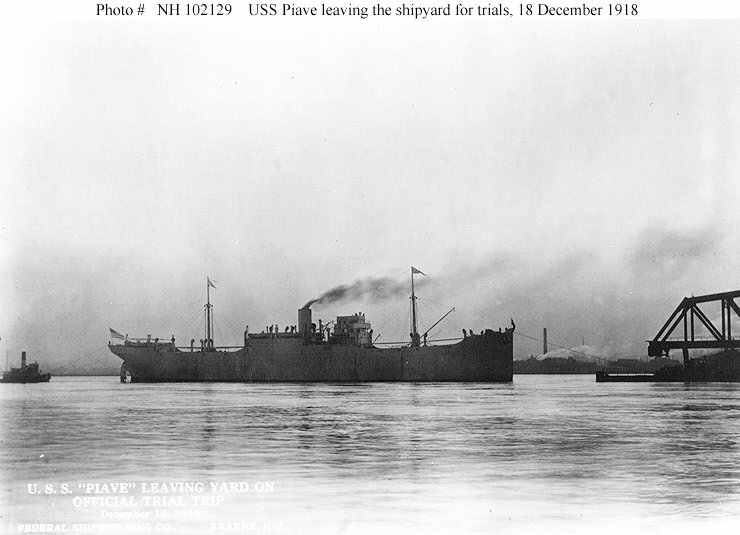 Piave was struck from the Navy List 4 February 1919.